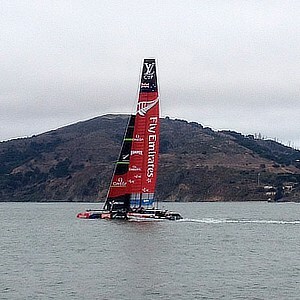 Port of San Francisco America's Cup Races CEQA/NEPA - Applied Marine Sciences, Inc. In support of the America’s Cup Races in San Francisco Bay, the America’s Cup sponsor and the City and Port of San Francisco contracted a team lead by ESA to prepare the California Environmental Quality Act (CEQA) and National Environmental Policy Act (NEPA) assessments for the races themselves and for Port of San Francisco infrastructure improvements needed to support the America’s Cup race teams and spectators. AMS was a key member of this team responsible for identifying and assessing potential race and Port construction activities on marine resources. AMS prepared the marine biological resources and in-water impact assessment of the Project for both a CEQA assessment for the City/County of San Francisco, a NEPA analysis for the National Park Service, US. Coast Guard and Army Corps of Engineers, as well as Biological Assessments for the National Marine Fisheries Service and the California Department of Fish and Game on behalf of the federal agencies involved in the permitting of the Project. The project’s extremely tight schedule had all CEQA analysis and permit applications completed within six months of commencement.